Because the tenderloin is just so tender and soft, the meat deformed as I applied the knife pressure, and even further as I cut through it. Are there some techniques, or specific tools to cut steak out of tenderloin or tender piece of meant in general? 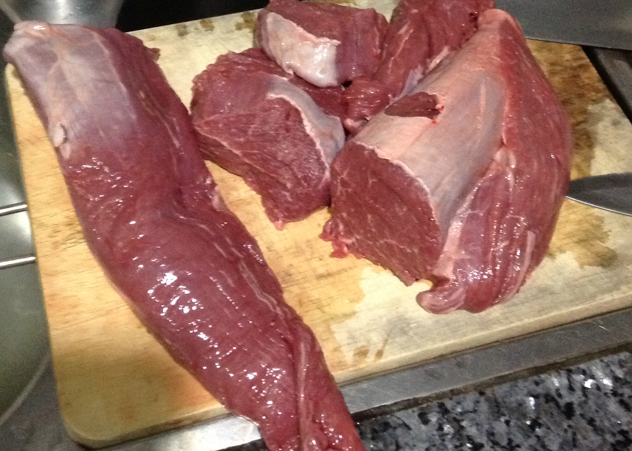 You should apply as little knife pressure as possible in order to keep the meat from moving as you slice. I can offer a few suggestions towards that end. First you need to take the translucent white stuff off. That silverskin is much tougher than muscle and is probably making you use too much force as you cut through it. You also don't want it on your medallions, and it's much easier to take it off the whole tenderloin than the smaller portions. Get your filet/boning knife and use its tip to get under one end of the silverskin, then lift up the flap and slice just under it, keeping your knife more or less flat and parallel to the table. The silverskin will tend to come off in strips -- it's made up of long lengthwise fibers. It is fairly strongly attached to the meat, so don't try to tear it off; use your knife to separate them. At one end, it'll dive into/merge with the muscle -- you can see this in the large piece to the left in your photo. You'll probably end up with a little divot there; don't worry about it. The silverskin is waste -- it doesn't have any flavor and is impossible to chew -- so just toss it. Finally, there are two possibilities for the position of the tenderloin and your hands relative to each other. You should try them both to see which produces better results for you. You can portion either from the right or left end of the meat. (Assuming a right-handed knife wielder,) portioning from the left involves pressing your free hand against the cut face of the meat (where you separated the last medallion), supporting it. This is the way that sashimi is cut, and I find that it makes it easier to get evenly-thick and consistently-sized slices. If that doesn't work for you, and you're still having trouble getting smooth faces to the medallions, you can cut from the right end, and use your free hand to squeeze or compress the meat (not too hard, though -- you don't want to damage it) to hold it still while you cut. In this case, grab the tenderloin just past where you're going to make the cut. Ultimately, though, don't worry too much about the face of the cuts. Any unevenness less than about 3/16 of an inch won't even be noticeable once you've put a nice sear on it. Put it in the freezer for 30-45 minutes before you cut it. That will solve the problem! Not the answer you're looking for? Browse other questions tagged steak cutting or ask your own question. Is there any cut of beef that's close to Kobe beef? Should I write Steak or Beef Tenderloin on the menu?